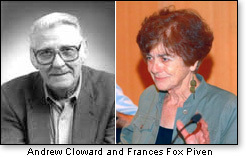 In 1966, two Columbia University sociologists, Richard Andrew Cloward and Frances Fox Piven, collaborated on a theory to end poverty in the United States. This theory, today, is referred to as the “Cloward-Piven Strategy.” People who are familiar with the likes of Saul Alinsky and William Ayers are familiar with the strategy, as are the full complement of the Progressive Movement. In a nutshell, the underlying principle of the Cloward-Piven Strategy is to so overload the entitlement system – to add so many to the entitlement rolls, that the country’s economic system collapses, unleashing chaos and violence in the streets, thus affecting radical Leftist political change in government. Up until recently this theory has been just that, a theory, and a theory that anarchists and Progressives have salivated over for their want of execution. But today, we are seeing the fruits of the Cloward-Piven Strategy played out to success in Greece and several other financial destitute countries in Europe. To summarize briefly the Cloward-Piven Strategy, I turn to Richard Poe who wrote an article of the same name, which is featured at DiscoverTheNetworks.org. Mr. Poe observes that Mr. Cloward and Ms. Piven sought (and “seeks,” in the case of Ms. Piven) to facilitate the fall of Capitalism by “overloading the government bureaucracy with a flood of impossible demands, thus pushing society into crisis and economic collapse.” Mr. Poe explained that Cloward and Piven saw the so-called “ruling class” as using entitlements to “weaken the poor”; to make the poor dependent on government, thus “dousing the fires of rebellion,” following the “don’t bite the hand that feeds you” theory. In a 1970 New York Times interview, Cloward is quoted as saying that poor people can only advance when “the rest of society is afraid of them.” He then theorized that activists should refrain from demanding that government provide more for the poverty stricken and, instead, should strive to pack as many people on the welfare (read: entitlement) rolls as possible, creating a demand that could not be met, facilitating the destruction of the welfare system and massive financial crisis. As a byproduct, rebellion would be ignited amongst the people; chaos would rule the streets and governments would be damaged beyond repair, many falling to history making it possible for new radicals to assume the roles of oligarchs, ushering in new systems of government and the dismantling of the Capitalist system in particular. Both Cloward and Piven understood that it would take pushing the American citizenry to the point of anarchy, to the point of the populace affecting violent chaos in the streets, for there to emerge an opportunity to damage our Republican form of government and our Capitalist system to the point where people would accept radical political as well as economic change. Cloward and Piven, using the philosophy of Saul Alinsky (who, by-the-by, was their inspiration in fomenting their “strategy”), knew that they would have to achieve chaos, so as to introduce the Progressive political ideology – the ideology of Democratic Socialism – to the masses as a saving grace. It is easy to see how our expanding entitlements and our population’s expanding dependency on government, combined with the purposeful engagement in reckless fiscal policy, plays directly into the demise of the country by accelerating the poison of the Cloward-Piven Strategy. I will take this a step further. As we watched the so-called Arab spring play out, we saw that international labor unions – international labor unions, the likes of the SEIU – had boots on the ground, honing their organizational skills, as violent chaos reigned supreme. In Greece, as in Spain, France, Italy and every other European locale wrestling with financial insolvency, labor unions – international labor unions – were on the frontlines of the protests, antagonizing the anarchists and fomenting discontent amongst the masses. In each locale the tactic was the same: Get the masses irate enough to demand, “Give me what I deserve,” even if they don’t deserve it; even if they haven’t earned it. To those provoking the anger it makes no difference if there is nothing to give; that these governments are in such massive debt that there is a very real possibility that they will all fail, one domino after another. ▪ Do Progressive international labor unions mean to re-create the political change realized in Europe; in Greece; in France, here in the United States? ▪ Do the Progressive international labor unions mean to create the anarchy, the violent chaos in the streets, needed to affect the “fundamental transformation of the United States of America”? ▪ And are Progressives who exist in elected federal office purposefully exploiting their power to engage the efforts of the Progressives in the international labor unions to accelerate the metastasis of Cloward-Piven? These answers are essential and they need to be answered using a mentality sequestered from the inanity and self-effacing mandate of political correctness; an instituted dogma originated by the Progressive Movement. If Greece, and the whole of the Eurozone, was the ideological Petri dish for whether Cloward-Piven would actually work, the results are in and they are not good. They are not good for freedom, liberty or Capitalism, the only “ism” that has every elevated people out of poverty. If the overthrow of governments achieved in the Arab Spring and the financial assassinations of governments achieved in the Eurozone are the affects of a successfully implemented Cloward-Piven Strategy at the hands of the Progressive Movement, the results are frighteningly disastrous for you and me. FamilySecurityMatters.org Contributing Editor Frank Salvato is the managing editor for The New Media Journal. He serves at the Executive Director of the Basics Project, a non-profit, non-partisan, 501(C)(3) research and education initiative. Reblogged this on PUMABydesign001's Blog. bookmark your blog and definitely will come back in the foreseeable future. I want to encourage one to continue your great posts, have a nice evening! Mark Caserta: Trump cleared: Time to investigate the real Russian collusion.